Book Giveaway! Tim will be giving away a complete set, all four!, Poke Rafferty series hard cover books, plus one of hisJunnior Bender books. In order to win, leave a comment and he will draw from the pool at the end of the MYSTERY WE WRITE blog blitz (December 9). Timothy Hallinan is the Edgar-and Macavity-nominated author of the traditionally-published Poke Rafferty Bangkok thrillers (most recently THE QUEEN OF PATPONG), and the Junior Bender mysteries, which are ebook originals. 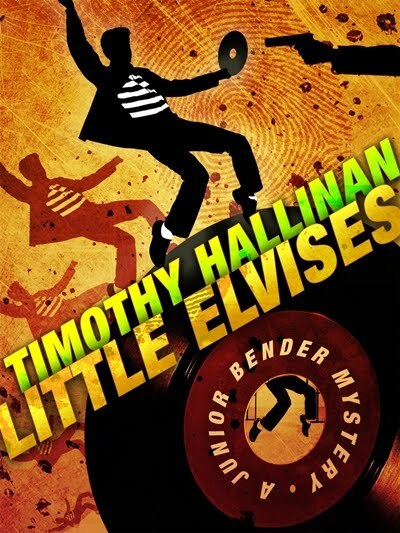 The newest Junior book is LITTLE ELVISES. Earlier this year, Hallinan conceived and edited a volume of original short stories by twenty first-rate mystery writers, SHAKEN: STORIES FOR JAPAN, which is available for the Kindle at $3.99, with every penny of the price going to the 2011 Japan Relief Fund. (Please buy it.) He lives in Santa Monica and Southeast Asia, and he is lucky enough to be married to Munyin Choy. His website is http://www.timothyhallinan.com/. Tim is going to tell us today about Books Unwritten, a subject near and dear to any reader's heart. The world is full of books I want to read, but some of the ones I most want to read don't actually exist. They're books that haven't been written yet, by authors who seem to be taking very long sabbaticals. Six years is a long, long time between books, especially for a writer as young as Yoshimoto is. If it would have any effect, I'd find out where in Tokyo she lives and stand under her window, like Brando did in "Streetcar" when he shouted, "Stellaaaaa." I'm not sure shouting "Bananaaaaaa" would have the same effect, but I don't know what else to do, and I don't just want another Banana Yoshimoto novel. I need one. And then there's the new Sheila Bosworth novel that doesn't exist, the follow-up to two of my favorite books of the last century (doesn't that sound Victorian? ), Almost Innocent (copyright 1984) and Slow Poison, which came out in 1992. One was published by Knopf and the other by Simon and Schuster, so Bosworth was taken seriously by the right people, as she should have been, since the books are Southern fiction at its most florid and idiosyncratic: compelling, tropically lush, richly colored, and on occasion feverishly funny, with a truly skewed perspective. Sheilaaaaaaaa!!! Where's the new one? Keith Snyder wrote six terrifically funny mystery novels set in, of all places, Pasadena, primarily in a leaky, decaying mansion that has become a boarding house for a collection of indolently brainy, intermittently crazy young people, centered (for the purposes of the books, at least) on a musician and conversational polymath named Jason Keltner. The mysteries themselves are fine -- nicely structured, with lots of forward momentum to keep your page-turning finger moistened, but they're primarily devices to get these people talking, which they do brilliantly. And then they talk some more. I could listen to them for days, and have. Ruth Ozecki was responsible for My Year of Meats in 1998, which promptly earned a central position on my personal altar of phenomenal novels, books that managed to break my heart, turn my stomach, make me laugh, and make me cry, sometimes simultaneously. She followed it up in 2002 (I think) with All Over Creation, American magical realism—of which there isn't much—at its absolute best. (Ozecki would probably hate hearing the book described as magical realism.) So here we are, nine years later, and where's the new one? There's permanent negative space on my bookshelves, waiting for it. Once in a while, though, a writer who seems to have hung up his pen for good suddenly re-emerges with a vengeance. The case in point that makes me happiest right now is Martin Limon, who in 1992 wrote Jade Lady Burning, a sensational mystery about two American military investigators stationed in Korea just after the war. He got pretty much everything right, although one of his two cops, Ernie Bascom, is something of a Neanderthal and takes some serious putting up with. In 1997 and 1998, Limon put out Slicky Boys and Buddha's Money, both terrific books -- and then he went away forever. I asked everyone -- agents, booksellers, publishers -- what happened, and nobody knew. And then, in 2005, he returned on the scene with The Door to Bitterness, and last year (he's really in a spurt now) Soho Crime released The Wandering Ghost. So welcome back. Any nonexistent books you'd like to read? I limited this post to living writers, but you don't need to. What nonexistent book would you most like to have appear under your pillow some long winter's night? I'm coming up empty on nonexistent books - I don't think I'm going to live long enough to read all the books already written that I feel I just must read. Glad I've read all the Poke Rafferty books to date and I have started on the Junior Bender series. Like Pat, I have too many TBR books on my list to contemplate those not written, but you raise an interesting point, Tim. Six years between books is a long time, yet I find it reassuring there are writers who don't (and perhaps won't) crank out books like cookies on an assembly line. Or, maybe it's just that I'm behind deadline myself and looking for excuses! ;-) Great post. You know a writer is gifted when his blog posts read like literature. So, here is one so-far-nonexistent book I’d like to read. It’s Tim Hallinan’s story of the writing teacher who slips off the rails after grading one too many short stories and travels the world standing under the windows of his favorite authors and imploring them to write because only their work can restore the karmic imbalance caused by his students. Of course under the actual story is the protagonist’s frozen, ninety-percent submerged voyage of self-discovery. There are also so-far-nonexistent books which may, alas, remain forever uninstantiated. One is the sequel to Life of Pi by Yann Martel. I read that Martel is working on new novel dealing with the holocaust with the two major characters being a monkey and a donkey. Anyone who has read Life of Pi will suspect, as I do, that the attempt to create another such story is a fool’s errand, but I hope I am wrong. Thanks, Tim, for this thought-provoking post. So happy to have you on my Blog site today, Tim. I can't imagine having six years between books. At my age, I'm going to keep on writing until I can't. Once more I'm going to tell you how much I enjoyed The Queen of Patpong. I read it while on a cruise and it certainly added to my experience. You are definitely a master at story telling. Tiiiiimmmmm, where's the next Poke Rafferty novel? I'm going to have to read THE QUEEN OF PATPONG over again while I'm waiting. Non-existant books? Oh, you opened yourself up to THAT one, my friend! The Real Deal - in which we learn the TRUE story of how Junior Bender stole all three doors from Monty Hall. Winding The Watch - in which Eleanor Chan saves Simeon Grist from a fate worse than death: stalked by the paparazzi. A Poke In The Caboose - in which Miaow is kidnapped and Poke and Rose race from train to train, border to border, to Infinity and Beyond, through darkest night and darker day, only to find that Miaow has just run off with her boyfriend and raising teenagers is a pain in the caboose. Hi, everyone. In re-reading this, it's me at my most querulous, wanting things I can't have when I already have more than I have any right to wish for. But I thank you all -- Pat, Anne, Mike, Wendy, Jinx, Marilyn, and Jean for taking me seriously. And also for mentioning the Poke books. Mike, I couldn't agree more. The Martel book sounds like a disaster. This is a writer who may be trapped by success. And the new Poke book, THE FEAR ARTIST, will come out in August, so it's at least nascently existent. Interesting post and even more interesting comments. I think I'm becoming addicted to hanging out with all of you. I can hear you hollering, "Bananaaaaaa," Tim! And, as I've said before, I love your writing. Great post. I'm sure that are lots of nonexistent books I'd like to read, but I'm not imaginative enough to think of them. What an interesting post--AND comments! Really enjoyed. Tim, you've got me thinking about nonexistent books. Give me a couple days, and I'll come up with some. All I can think of now are the dozens of books I'd like to write myself.